Sure balance is a cool trick, but could it be linked to anything meaningful? Besides the risk of falls – which are a problem for the elderly – does balance matter for the rest of us? Who needs to be able to stand on one leg to get to work, nail that interview, or pick up their child from swim practice? Since the small muscles and ligaments of the spine have a lot of proprioceptive (position sense) nerve endings, could damage to these structures result in poor balance? In 2010 Alexander Ruhe (Germany), Rene Fejer (Denmark) and Bruce Walker (Australia) published a systematic review of balance and back pain in European Spine Journal. They found 16 articles investigating the topic of back pain and balance and summarized the results. The bottom line: people with back pain had worse balance as indicated by greater “sway” (a measure of trunk movement when standing), and increased center of pressure excursion, but most found no correlation between reported intensity of pain and sway. The force plates were used to make two types of measurement: center of pressure excursion and sway. The center of pressure is the point on the force plate which is the average of the force your feet are exerting on the plate; it is the point on the force plate that is directly below your center of gravity. When your weight is evenly distributed, the center of pressure is directly between both of your feet; when you lean on one foot the center of pressure shifts towards that foot. The excursion of the center of pressure is a measurement of how much the center has moved. Sway is a measure of the amount of trunk movement when standing. To demonstrate: Stand still with your feet together and your eyes closed. You will feel yourself drift from side to side, and this drifting is sway. More sway indicates less stability, i.e., poorer neuromuscular control. The task of standing upright without falling is quite an accomplishment of the nervous system and requires constant adjustment, so some sway is normal. The difference in sway between people with and without back pain is greatest when eyes are closed. Everyone’s balance gets a little worse when they close their eyes except for individuals with low back pain, whose balance gets much, much worse. It’s important to note that this data is retrospective and not prosepctive. Yes, people with back pain have worse balance, but this does not mean that people with poor balance are going to get back pain, or even that working on balance will reduce back pain. Perhaps the poor balance was simply a side effect of being distracted by pain. If this were the case, pain in any part of your body would worsen your balance—but this is not the case. Studies cited by Ruhe et al. demonstrate that the pain has to be felt in a part of the body that helps with balance for the pain to interfere with balance. For example, in studies where salt water injected into a muscle to create temporary but harmless pain to see how the body reacts, painful saline injections in the arm (biceps) had no effect on balance, but saline injections in the low back or bottom of the foot caused balance to worsen. This suggests that pain is at least part of the reason that balance is poor in people experiencing back pain. In this case, getting rid of the pain should improve balance. It is also possible that balance worsens with back pain due to a loss of proprioception after injury to ligaments and small proprioceptive muscles of the spine. In this case, working on the balance would be an important part of rehabilitation. 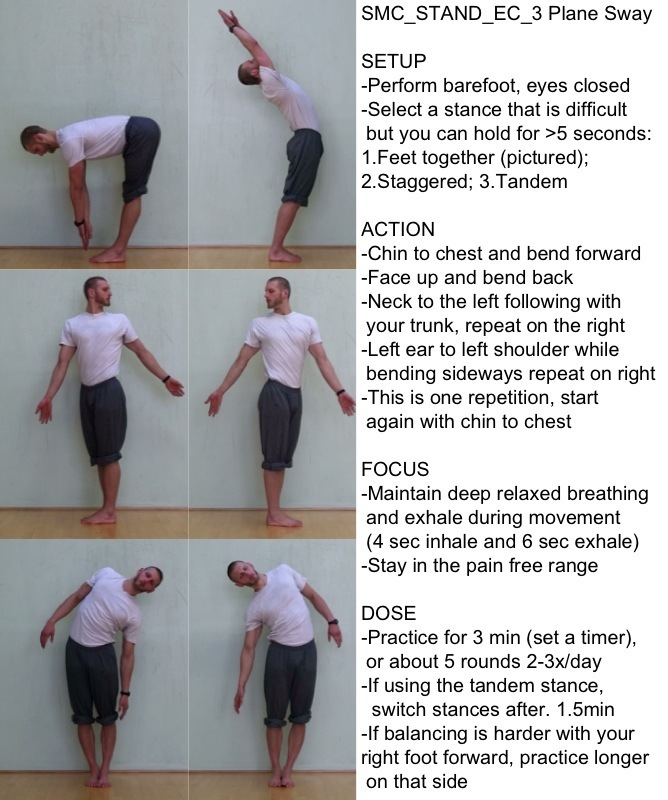 You can try the following balance exercises to see how much sway you actually have; it may be more challenging than you expect, and will indicate how hard your nervous system is working just to keep you upright! While you may find them to be too easy, they can be really challenging for people with back pain. Disclaimer: This article shall not be construed as medical advice. If you experience pain, seek out a medical professional. This entry was posted in General, Science Reviews You Can Use. Bookmark the permalink.